In the winter we are big fans of baked potatoes. They are so easy to make for dinner alongside a slow roast or lasagna bake. 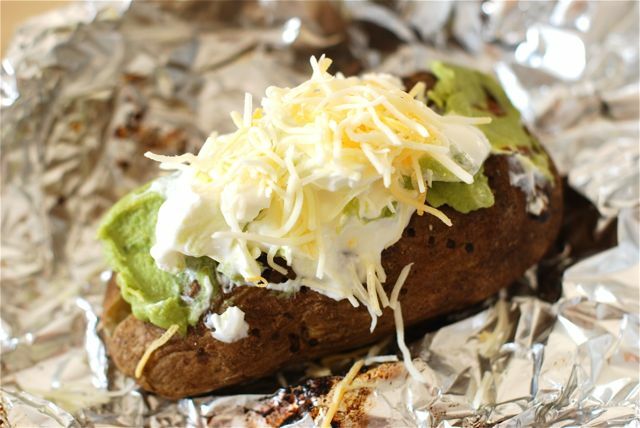 Sometimes we even just make a baked potato bar and that is our dinner! The other day I had some guacamole and chile con queso left over from enchiladas, so I decided to make these awesome loaded potatoes. They had a great Tex Mex flair and were packed with flavor. We ate these Tex Mex baked potatoes alongside our chili for dinner, but they would make a nice light dinner on their own. Wow your family with this quick and flavorful Tex Mex inspired dinner! Step 2: Prick the potatoes a few times with a fork and rub them all over with a touch of olive oil. This will help the skin get crispy. Bake the potato for 1 hour. Step 3: Remove the potatoes from the oven and allow them to cool for 10 minutes. Then slice each one at the top and push in the ends so a little pocket forms. Step 4: Use a knife to cut about 3/4 down into each potato to make a deep well. In well load in your Mexican toppings as desired. Let the potato sit for about 10 minutes so the cheese melts and has time to sink in. Slice and serve!